Set up: Half court, 3 stationary feeders, 3 balls, 1 attacker, 1-3 defence. Feeders are placed in an extended triangle formation. Each feeder has a ball. Attacker drives out from transverse line to first feeder where a pass is received, attacker returns pass and moves around the feeder. Attacker does so with the other two feeders in the extended triangle formation creating a 'zig zag'. Attacker works her way through the 'zig zag' in both directions without errors. 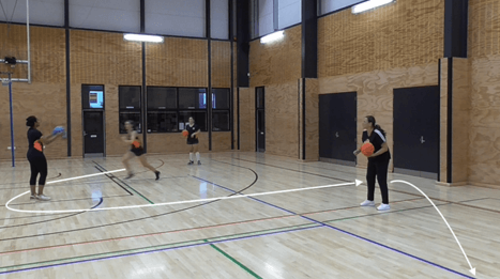 You can choose this drill simply without defence for players to get used to changing direction, moving around players and incorporating basic skills of catching and passing. 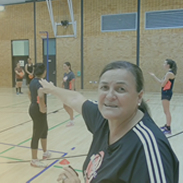 With more experienced players you may choose to enforce limitations to put them under pressure – for example, having to achieve the whole drill without dropped balls or within a time limit. Passes get misjudged and thrown away. Add one defender to the middle of the triangle. Add two defenders to the middle of the triangle. Time each player to get a successful run through. make it a competition- fastest time to complete the drill with no errors.